I'm a squeamish viewer when it comes to most media, which is why I'm still surprised that I enjoy Japanese body horror manga so much. Sights that would repulse me in an American comic are somehow fine by me as long as they're in black and white on a smaller page. Some of this goes back to my favorite manga, Bio-Boosted Armor Guyver, an entire superhero franchise based on terrifying bodily contortions. Following in this vein, I found Dorohedoro in a sale on Comixology and thought it held a similar appeal. It's the brainchild of Q Hayashida and, having ended not too long ago, will hopefully make its way to animation in the next few seasons. 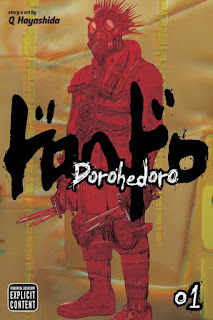 I was trying to find the right way to describe Dorohedoro until I found out that Sunday Comics Debt beat me to with "the manga Grant Morrison never wrote. There are lots of complex and intriguing ideas and some very good storytelling, but the overall weirdness obfuscates everything. While reading the first volume of Dorohedoro, I ran into two problems, neither of which are really the manga's fault. This collection ends rather suddenly and with all sorts of questions left unanswered ... including many of my own questions about how the world of the manga works. I had to go back over the stories and corroborate what I found with TV Tropes to figure out that I wasn't missing anything; instead, there are several more collections to go before many of the enigmas get addressed. Not helping is the larger problem of Comixology's manga reader being awful. It automatically goes to two-page view and requires you to zoom in every time a page is flipped. It's also unable to be turned off as far as I can tell. This is a shame because the artwork is definitely one of Dorohedoro's greatest strengths. There are several parts where it looks less like a manga and more like Tank Girl. Because many characters wear masks, Hayashida is able to make them look unique most of the time and save their somewhat generic normal faces for when emotion really needs to come to the fore. The downside to this is having to remember which faces go with which characters. The world of Dorohedoro is one where magic has run rampant, leaving non-powered humans as fodder for experimentation by powerful wizards. Many characters are in some way deformed, including the main character, Caiman. He used to be a man and now has the head of a velociraptor ... and that's the normal quirk. There's also a head in the back of his very large throat and he keeps swallowing people head-first to try and make contact with it. Otherwise, he's the ever-hungry, slightly lazy but lovable main character of so many anime and manga. While searching for the wizard who changed him, he seeks out those who abuse their power with the help of his human friend Nikaido, who also happens to be the best cook in their dwelling, the Hole. From the Hole, wizards can open pathways into their own alternate dimension. This allows interaction with a group of villains who make up the rest of the main characters, starting with the crime lord En. Capable of turning foes into piles of mushrooms, his faceless look anticipated Immortan Joe from Mad Max: Fury Road. His underling, the weak wizard Fujita, is the first person we see Caiman testing his head-biting on, and he remains the go-to target of abuse throughout the manga. There are a lot of characters thrown at the reader very rapidly in the wizard-focused chapters, and so far one of the most important is Ebisu, a young female wizard deformed by Caiman's mouth. It's difficult to get a read on her at this stage apart from her overall weirdness. Another is Noi, En's cousin and best enforcer. There's no mistaking the importance of one last character: Noi's partner, Shin. Equipped with a mask in the shape of a human heart, his personality and antics remind me of Deadpool. Shin's one of the more respectable characters despite working for En's gang; at the very least he's less likely to kill you while your back is turned. The reveal of his real face beneath the mask is kind of a shock along with being the first indication that masks are worn by just about everyone in the wizard world. He also has the most horrific of body horror-related abilities, which you'll have to read to find out about. I won't say that Dorohedoro is right for a first-time manga reader, but if you're used to how crazy manga can get, then you'll enjoy it. It's clearly the tip of a very large and very interesting iceberg. My main piece of advice is to not get this on Comixology but instead order the physical collection through Amazon or another retailer. The sheer amount of detail in the art needs to be seen up close to fully enjoy it. In next month's "Entry Plug," I'll continue looking at body horror with a manga that made its way to television screens last year. In the meantime, make sure to check out the anime version of my first "Entry Plug" review, One Punch Man, which was regarded as one of the best anime of 2015. The first episode is a panel-for-panel perfect adaptation of the first manga volume.